Join Us For Maker Fest 2019! 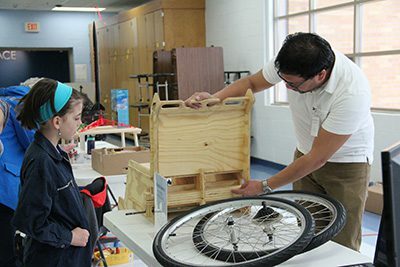 See our community’s hard work come to life at Maker Fest in the AnnMarie Thomas Makerspace on Saturday, February 23 from 1-3 PM. Anyone is welcome to attend as a spectator. No RSVP is necessary! Participation is open to everyone in our community—students, parents, grandparents, alumni, parents of alumni, faculty, staff, and more–showcasing a variety of skills, crafts, inventions, and activities. Maker Fest is the perfect opportunity to “show and tell” something that you have created and share your accomplishments. If you have questions, please contact Ms. Koen, Makerspace coordinator, at nkoen@moundsparkacademy.org.